Another ‘Bachelor’ Couple Splits: Ben & Courtney Are Done! Here's the obligatory "split down the middle" picture. Well, that actually lasted longer than I thought it would. 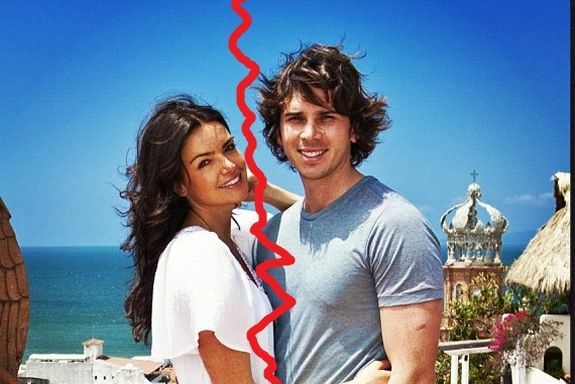 Despite the fact that they recently told a magazine that in five years we could expect them to be married with babies, Bachelor couple Ben Flajnik and Courtney Robertson have called it quits. I’ll give you a moment to get over your shock. The couple, who have been engaged since November 2011 when Ben proposed to a jubilant Courtney in a made-for-TV moment on top of the Matterhorn, officially confirmed their split to In Touch. “After meeting over a year ago, we have decided to end our romantic relationship,” the couple told the rag mag in a joint statement. “The ups and downs weighed heavily on us both and ultimately we started to grow apart because of the distance, time apart, and our need to focus on our respective careers. The Ashley has always felt that both Courtney and Ben had their own reasons for staying in the relationship, and that those reasons had little or nothing to do with love. Ben wanted to promote his wine business and Courtney wanted to promote her face in order to get more some acting roles. Courtney and Ben are just the latest couple from the show to fall victim to the ‘Bachelor’ curse. Earlier this year, Ali Fedotowsky split with her fiance, Roberto Martinez after a long engagement. Ashley Hebert and J.P. Rosenbaum; and Emily Maynard and Jef Holm are the only couples from the franchise that are still together and could possibly give us a made-for-TV wedding. Ashley and J.P. recently confirmed that they plan to get married (on TV, naturally) in December! Fingers crossed! But then again so were the other 2 mentioned couples. Women are better judges of character. Trista & Ryan were on The Bachelorette though. There’s one more couple that’s still together, Trisha and Ryan Sutter! They are the only couple who has outlasted everyone so far!